By wire to the (finished article) knit, to know all the processing characteristics and the many creative possibilities of this raw material flexible and versatile. (Read more). By wire (finished garment) knit to know all the processing characteristics and the many creative possibilities of this raw material flexible and versatile. In Module 4 will analyze the activities of F.D that achieves a Total Look collection includes knitted garments made by machine or by hand. 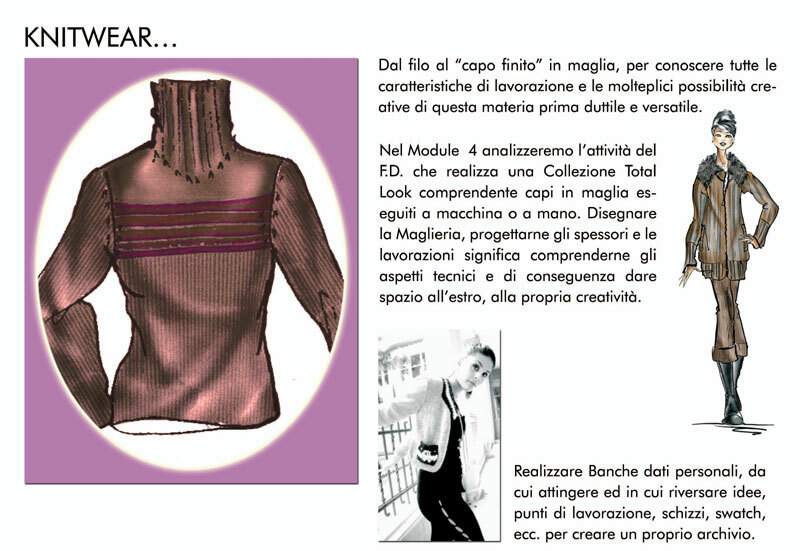 Knitwear draw the means to understand the technical aspects and therefore give space to play creatively, to their creativity. Banks realize personal data to provide input and to pour ideas, working points, sketching, swatch, and so on. to create its own archive.